On Saturday 30 September a short service will take place to mark the placing of a memorial stone on the grave of Jack Whitley at Brompton Cemetery. The grave for Whitley, who died in 1955, was previously unmarked and funding for the stone was raised by a crowdfunding campaign organised by the Chelsea Supporters Trust. Before the unveiling ceremony, there will be a guided tour of Chelsea related graves at 11.00 am held by Chelsea Historian Rick Glanvill. If you want to go on the tour meet at the North Entrance to the Cemetery (nearest to West Brompton tube). The ceremony to unveil the memorial and inscription will be held at at 12.00 pm at the grave. Everyone is welcome to attend both the tour and ceremony. Jack Whitley’s grave can be found at the north-east corner of Brompton Cemetery and is a 5 minute walk from West Brompton station. The 74 and 430 bus’ stop just outside of the cemetery entrance. Thanks to the remarkable generosity of Chelsea supporters – and those of other clubs, including Everton and Manchester United – the target of £5,500 was raised within weeks. Descendants of Jack were traced and several family members will be present at the service, as well as the match later that day against Manchester City, the special guests of Chelsea FC. For almost half of his life Jack was a wonderful servant of Chelsea FC. He signed as a goalkeeper from Lincoln in 1907 and kept a clean sheet on his debut against Newcastle United 110 years ago this month – the new club’s first win in the top flight. After retiring as a player in 1914 he became “Mr Chelsea”: the first team trainer, responsible for all areas of coaching and fitness, with a big role in player liaison and transfer negotiations. He was also trainer of the England team on several occasions – the de facto manager of the national side. After 32 years at the Bridge, new manager Willie Birrell decided to freshen up the back room staff and Jack was let go in 1939. He eventually moved to Hertfordshire, where he was to die in 1955 – a few months after his beloved Blues won the league championship for the first time. Having committed so much of his life to the Stamford Bridge club it was fitting that he should be buried just across the tracks from the stadium – a fact that only came to light recently as a result of new research by official Chelsea historian Rick Glanvill. Jack has earned a unique distinction in Chelsea history. Not only did he serve the club for more than three decades, but he is the only known footballer to be buried at Brompton Cemetery. The Royal Parks green-space, adjacent to Stamford Bridge, is also the final resting place of former directors, supporters, a chairman, and a manager of the club. 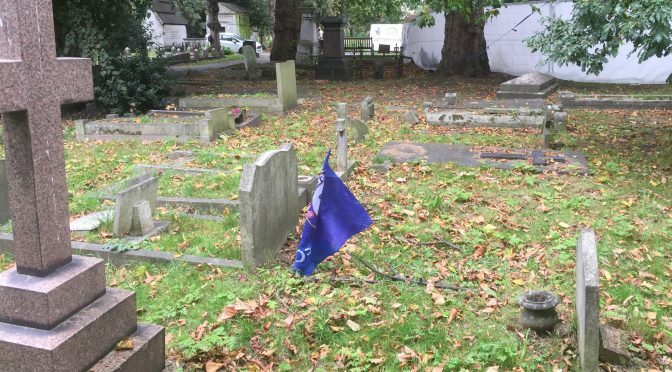 All the graves there are tended by the Chelsea Supporters’ Trust’s cemetery clean-up group, run by Cliff Auger, and the Trust has overseen the process of placing a stone on the Whitley grave in conjunction with Glanvill. We would like to thank all those who kindly donated money towards the fund, whatever the amount, and express our gratitude to Milestone Memorials, Royal Parks, the Friends of Brompton Cemetery, and Chelsea FC, for helping to make this happen. Click here for a breakdown of how the £5,500 was spent.